On 23 October 1946, an airline called ‘Orient Airways‘, was registered in Calcutta, that would one day become what is known as Pakistan International Airlines. Let us celebrate 65 years of literal ‘ups and downs’ by remembering some Historic Firsts achieved by this beloved household name of Pakistan. – The first non-communist airline to fly to the People’s Republic of China, and to operate a service between Asia and Europe via Moscow. – The first airline in Asia to induct the new technology Boeing 737-300 aircraft. – An IBM 1401, the first computer in Pakistan, was installed in PIA. – The first airline to introduce a second route to People’s Republic of China over the mighty Karakoram mountains. – The first airline to show in-flight movies on international routes. – PIA set up Pakistan’s first planetarium at Karachi. – The first airline in South Asia to introduce auto-ticketing facility. – The first airline in the world to fly to Tashkent, capital of the newly independent state of Uzbekistan. – First airline in the world to start Air Safari with jet aircraft. – First Asian airline to start flights to Oslo, the beautiful capital city of Norway. – First airline in the world to induct Boeing 777-200LR, the world’s longest range commercial airliner. – First airline in South Asia to offer the facility of seat reservation through mobile phone. 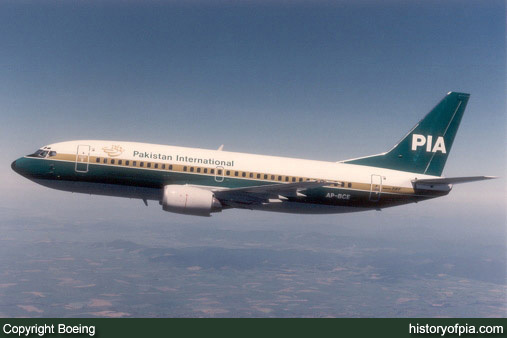 PIA was the first Asian operator of Boeing 737 series 300 aircraft.